NORTH COUNTY (3-25-16) — In terms of championship games, the fact that Steele Canyon slaughtered Coronado 17-1 in Thursday’s (Mar. 24) 66th Annual Lions Tournament 6A Division final is more the unusual than the exception. Steele Canyon, which stumbled out of the gate at the beginning of the season, has been on a bender since the start of the Lions Tournament. The Cougars (6-4) are not known for hanging around championship circles. But they put their thumbprint on this one. MICHAEL FITCH, who has been more of a relief pitcher out of the Steele Canyon bullpen, pitched a complete game 3-hitter and needed only 75 pitches to send the Islanders back to the peninsula. “I’m so happy that even though we were running out of arms and getting thin that we had guys come through,” said Cougars’ coach DAN NERAT. Steele Canyon scored 60 runs in five games (12 runs per game). 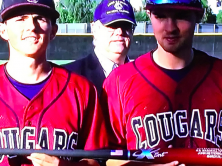 One of the big sticks in the Cougars batting order is sophomore JOSH ESQUIBEL who was 3-for-5 with 3 RBI. That includes 2 doubles and 2 stolen bases. All 10 of the Cougars in the lineup got hits. Speedy MATTHEW BAGDASAR was 3-for-4 with 2 stolen bases and an RBI. The onslaught was widespread for Steele Canyon in this one. KANE FIEDLER, who shared the Lions Tournament MVP honors with Esquibel, was 2-for-4 with 2 runs scored along with an RBI. TANNER LOGAN was 2-for-3 with a double, 2 RBI and 2 runs scored. STEELE CANYON 3, GRANITE BAY 2 (9 inn.) 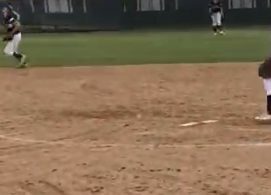 – Short-handed Steele Canyon got a major league lift when junior right-hander TYLER LUBAN spun a complete game, needing only 106 pitches to complete the 9-inning victory Thursday (Mar. 24) over Sacramento Granite Bay in the 66th Annual Lions Tournament 6A semifinals. Luban allowed only 4 hits and no earned runs and struck out 4 as he evened his record at 1-1. After falling behind 1-0 Steele Canyon tied the contest in the first inning on 2 walks, a base hit by AVERY TUCK and a sacrifice fly by JOSH ESQUIBEL. On the verge of losing, the Cougars tied the game in the sixth inning as Esquibel singled, stole second and third and scored on a balk. As the game carried over into the ninth Steele Canyon posted a two-out rally. LUKE ARIAS doubled and LANDON SCHIRER followed with a base hit. The issue was decided when MATTHEW BAGDASAR hit a slow roller to shortstop for a base hit that scored Arias when the shortstop fired to the plate too late to give the Cougars their fourth walkoff win of the season. In this game Esquibel went 1-for-3 with an RBI and 2 stolen bases for Steele Canyon. EL CAMINO REAL 3, GROSSMONT 2 – The Foothillers of Grossmont High rally came up a bit short as they dropped a semi-final game in the Classic Division semifinals of the 65th Annual Lions Club Tournament at Torrey Pines High on Thursday (Mar. 24) to El Camino Real of Woodland Hills by a score of 3-2. ADAM LOPEZ did his best as he had two of the Foothillers (6-3) five hits. One of those hits left the yard for a sixth inning leadoff home run to left field, his second of the year. A trio of Conquistador (10-2) pitchers kept the Hillers off balance all day. El Camino Real scored a pair of runs in the bottom of the first and then tacked on what would become the winning run in the bottom of the third inning. KANNON ROMERO came in and shut the Conquistadors down, going 3 2/3 innings of scoreless ball. “I think he is going to go into a starting role now,” Abruzzo stated. “He did a great job in this tournament. He really opened some eyes.” Over the course of two appearances in the tournament, Romero went 7 2/3 innings of scoreless relief. In the second, JAYDEN LOMBARDO doubled to left center to get the inning underway. KYLE PINEDA singled to move him over to third. Lombardo would come in on a double play ball that erased Pineda. Grossmont gets exactly what the pitching staff needs, rest. The Blue and Gold faithful will be cheering again on Thursday (Mar. 31) as they travel to Hickman Field to take on the Saintsmen of Saint Augustine in the newly formatted Bill Dickens Tournament. 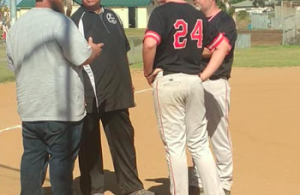 VISTA 9, CHRISTIAN 5 – KYLE STOWERS drove in 3 runs to support the starting pitching of CAMDEN BESSONE in Premier Divisions semifinals of the 66thAnnual Lions Tournament as the Patriots eliminated Scripps Ranch. Stowers hoisted a sacrifice fly in the third inning to help Christian take a 2-0 lead. The Stanford bound senior smashed a 2-run double in the seventh inning to help the Patriots (5-4) secure a victory over Scripps Ranch (6-3). Bessone, primarily a relief pitcher, blanked the Falcons on 6 hits over 5 1/3 innings to pick up the win. In the tournament finals, Vista bullied six Christian pitchers for 9 runs and 13 hits in a game they controlled from the third inning on. The Patriots who stranded 12 baserunners received a 2-run home run in the fourth inning from ZACH HOGUIESSON. First baseman CHASE WEHSENER was 2-for-3 with 3 RBI and a double. But it was not enough for the Patriots to tame the Panthers (8-2). 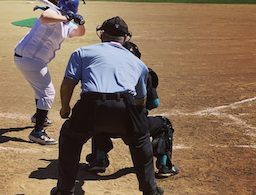 GRANITE HILLS 10, ROCKLIN 5 – Not surprisingly DILLAN SHRUM carried a mean club as Granite Hills tamed the Rocklin Thunder in a Lions Tournament consolation game on Thursday (Mar. 24). Shrum was the main menace for the Eagles as he went 3-for-3 with 2 doubles and 2 RBI as Granite Hills improved to 6-4. Shrum laced doubles in the first and fifth innings following a first inning base hit to hoist his average above the .400 mark. In the fifth inning Shrum capped the frame with a 2-run double in the lopsided victory. As far as pitching goes Shrum pitched four innings in an unspectacular performance but still came away with his second win in three decisions. JOSH VERDON pitched three innings of shutout relief to earn the save. TREVOR HAZELHURST was 2-for-2 with a pair of doubles for the Eagles. BRADY JOSLYN was 1-for-2 with 2 RBI including a double and a sacrifice fly. EASTLAKE 11, VALHALLA 6 – The winless Valhalla Norsemen (0-9) lost a heartbreaking hotly contested game Thursday (Mar. 24) in a consolation game of the 66th Annual Lions Tournament at Eastlake after surrendering a 7 run 6th inning. Freshman RILEY O’SULLIVAN paced the Norsemen at the plate going 2-3 with a single in the third and a home run in the fourth. He drove in one run and scored two on the day. Eastlake took an early 1-0 lead in the first but Valhalla came back with 3 in the third. O’Sullivan singled to lead off and moved to second on a sac bunt by COLE HOWARD. LEWIS DIRKES walked ahead of COLE HENDERSON’s double in the left center gap that plated O’Sullivan and the speedy Dirkes from 1st. Henderson would score on a passed ball and finished the day going 2-3 with 2 runs scored and 2 RBI. The Norsemen carried a 6-4 lead into the bottom of the sixth when Eastlake bats awoke and put up 7 runs for the 11-6 final. RANCHO CHRISTIAN 7, EL CAJON VALLEY 3 – El Cajon Valley blew a 3-2 lead in the 66th Annual Lions Tournament 1A Plus championship game in the fifth inning at Granite Hills High. Rancho Christian of Temecula put together a 5-run sixth inning to claim the championship. Gaskill, Wicksman (3), Filous (6) and Ward. Giovengo, Romero (4) and Hindorff. WP-Gaskill (1-0). LP-Giovengo (0-1). Sv-Filous. Bessone, Gentry (6) and Josephson. Meyer, Mullins (7) and Blake. Ramirez, Longora (4) and Lee. Rykoff (6), Stowers (7) and Josephson. WP-Longora. LP-Gentry (0-1). HR-Hoguiesson (Chr-1) 4th, one on. Fitch and Arias, Blethen (6). Butcher, McNeil (1), Hallenburg (4), Homan (6), Rollie (7), Jackson (7) and Knight. WP-Fitch (1-1). LP-Butcher. Fitzpatrick, Gustafson (4), DeLucchi (5), Smith (6) and Brown. Shrum, JoVerdon (5) and Fenn. WP-Shrum (2-1). Sv-JoVerdon (1). Poe, RO’Sullivan (6) and Heider. Rahim, Thompson (3), Hernandez (7) and Muno. WP-Thompson. LP-Poe (0-2). HR-RO’Sullivan (V-1) 4th, solo.